At San Diego Comic-Con 2018, the voice cast introduces fans to the next generation of Marvel heroes. Super Heroes, they’re just like us! They play in garage bands, eat cupcakes, and some even have big, bushy tails? Maybe not like us in every way but the heroes in Marvel’s new animated franchise “Marvel Rising” are certainly a diverse, fun-loving group who are ready for action. Marvel’s own Lorraine Cink hosted a panel with the talented voice cast, Dove Cameron (Ghost Spider/Gwen Stacy), Chloe Bennet (Quake/Daisy Johnson), Milana Vayntrub (Squirrel Girl/Doreen Green), Kathleen Khavari (Ms. Marvel/Kamala Khan), and Kamil McFadden (Iron Patriot/Rayshaun Lucas), who were joined by Cort Lane, SVP, Animation and Family Entertainment; Sana Amanat, VP, Content and Character Development; Marsha Griffiin, VP, Animation Current Series and Development; and “Marvel Rising” writer Mairghread Scott. Alongside Squirrel Girl is her best friend Kamala Khan AKA Ms. Marvel, and the duo works as a super support team. “She brings a lot of emotions to this that you haven’t seen in the past,” teased Khavari. Rounding out the group is Patriot who was mentored by Captain America himself. McFadden understood his character’s determination. “Not having superpowers means he has to work 10 times harder to prove himself to everyone and himself,” noted McFadden. When writing the scripts, Scott believed that the group of diverse, unique and charismatic characters showed the “world outside your window” and allowed young fans to see themselves on the screen. The panel revealed additional characters and the voice actors who will be making appearances on the show—Cierra Ramirez (America Chavez), Tyler Posey (Inferno), Booboo Stewart (Exile), Kim Raver (Captain Marvel), Dee Bradley Baker (Lockjaw/Tippy Toe), and Ming-Na Wen (Hala). 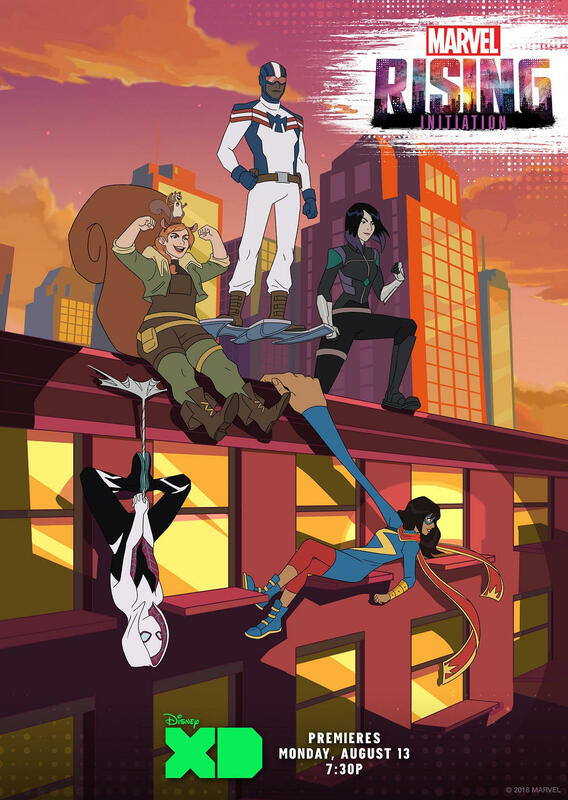 The “Marvel Rising: Initiation” animated shorts will debut on Disney XD on August 13 at 7:30pm, with the “Marvel Rising: Secret Warriors” full-length animated feature film airing on Disney Channel this fall. Attendees were treated to the first four “Marvel Rising: Initiation” shorts during the panel. Get a glimpse of it in the sneak below! Follow Marvel.com and “Marvel Rising” on Facebook, Twitter, and Instagram for all things “Marvel Rising.” And don’t forget to subscribe to Marvel HQ on YouTube for full episodes and more! As announced at WonderCon, get ready for more Dove Cameron, Daisy Lightfoot, Tyler Posey and Cierra Ramirez!